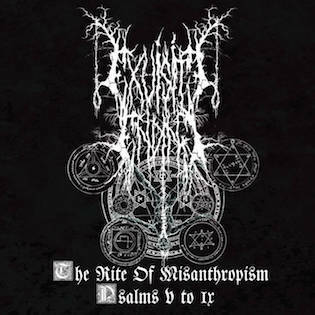 Exquisite Ending are a band from the United Kingdom that has been featured before in this zine and plays a very raw and misanthropic form of black metal and this is a review of their 2015 ep "The Rires Of Misanthropism: Psalm V -IX" which will be released in October by Hibernacula Records. A very dark and ritualistic sound starts off the ep along with some spoken word parts before going into more of a heavy and melodic style of black metal along with some grim screams and when the music speeds up a great amount of blast beats are utilized and at time s they music also brings in a small amount of deep growls. All of the songs bring in a great mixture of slow, mid paced and fast parts and most of the songs are rooted in the second wave 90's style of black metal and they also mix the spoken word parts in with the heavier sections of the music and all of the tracks avoid using any solos and leads to focus on more of a raw and melodic style of black metal. 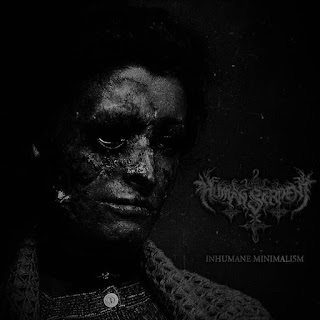 Exquisite Ending creates another recording that remains true to the raw and misanthropic style of black metal from the previous recording as well as continuing the concept that was present on the last ep, the production sound s very raw and heavy while the lyrics cover misanthropic, depressive, hatred and occultism themes. 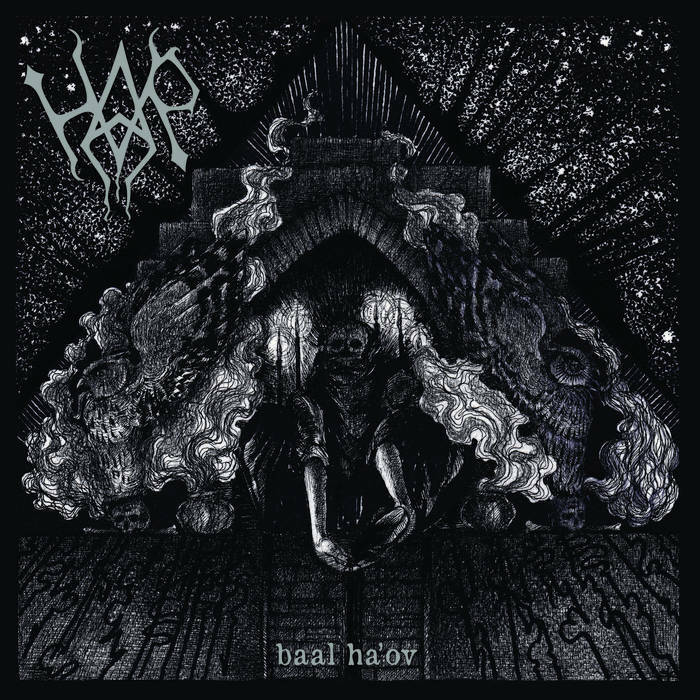 In my opinion this is another great sounding recording from Exquisite Ending and if you are a fan of raw and melodic occult black metal, you should check out this ep. RECOMMENDED TRACKS INCLUDE "Banishment Of Noble Coercion" and "Unbound Bloodletting Of The Orthodox". 8 out of 10. 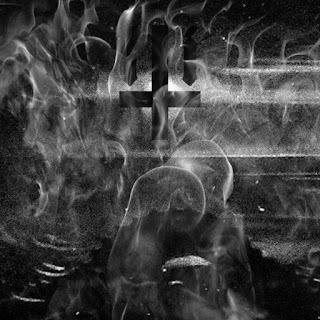 Blliigghhtted are a solo project from Turkey that has been featured before in this zine and plays an raw and satnic form of black metal and this is a review of his 2015 album "No Temple" which was released by Merdumgiriz. Drum beats start off the album along with some heavy guitars and grim black metal vocals a few seconds later and the riffs also bring in a raw style of the genre along with a small amount of melody and when the music speeds up a great amount of blast beats are utilized and the songs also bring in a great mixture of slow, mid paced and fast parts. A great amount of old school black metal elements can be heard throughout the recording and when solos and leads are utilized they remain true to a black metal style and some of the vocals bring in a small amount of melodic chanting and some tracks also bring in elements of sludge and doom metal.and the y also bring in a few instrumentals and the last track is very long and epic in length and is an ambient track. 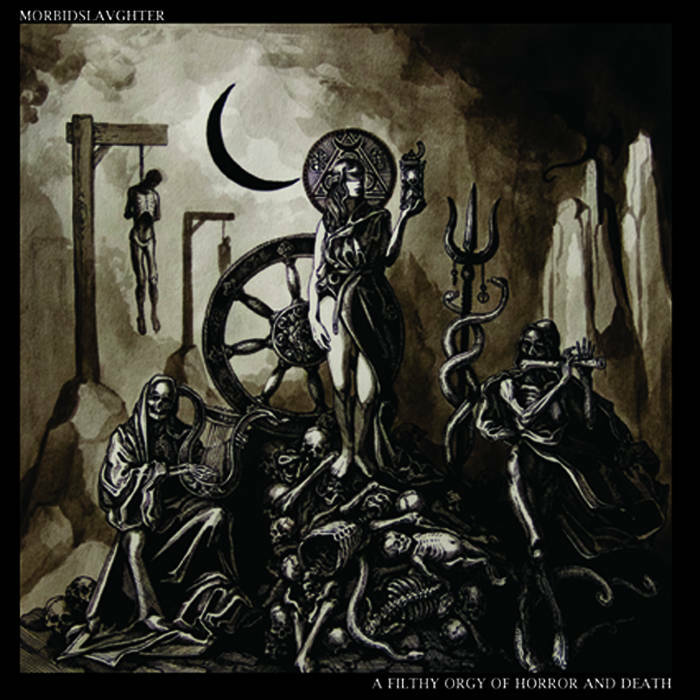 Blliigghhtted goes for more of a raw style of black metal this time saving all the ambient elements for the last track while the slower sections bring in a touch of sludge and doom metal, the production sounds very dark and raw while the lyrics cover philosophical, chaos and occult themes. In my opinion this is another great sounding recording from Blliigghhtted and if you are a fan of raw and old school black metal, you should check out this album. RECOMMENDED TRACKS INCLUDE "Chaos Serpents order" "Lucifer's Eyes" "Slithering Thoughts" and "Voyage". 8 out of 10. 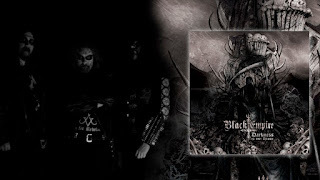 Justabeli are a band from Brazil that plays a mixture of black, death and war metal and this is a review of their 2015 album "Cause The War Never Ends" which was released by Black Lion Productions. Air raid sirens and war sounds start off the album before the music goes into a fast war/black metal direction that also brings in a good mixture of high pitched screams and death metal growls and all of the musical instruments have a very powerful sound to them and the faster sections also bring in a great amount of blast beats. Throughout the recording you can hear a great mixture of slow, mid paced and fast parts and some of the tracks also bring in elements of Swedish style melodic black metal and some of the more slow or mid paced drum beats have a militant feeling to them while some of the guitar riffs are also heavily influenced by early 90's death metal and there is also a brief use of spoken word samples, clean playing and melodic guitar leads present on the recording as well as a few seconds of clean singing. Justabeli plays a style of war metal that also mixes in with a raw and melodic style of black metal as well as mixing in a good amount of death metal elements to create a sound of their own, the production sounds very raw and heavy while the lyrics cover war, torture, terror and Satanism themes. 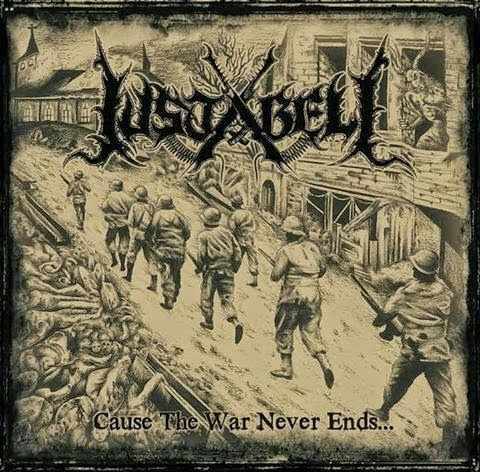 In my opinion Justabeli are a very great sounding mixture of war, black and death metal and if you are a fan of those musical genres, you should check out this band. RECOMMENDED TRACKS INCLUDE "Soldiers Of Satan" "Infected By Radiation" "We Are The Elite" and "Satan's Whores". 8 out of 10. Funeral Art are a solo project from Guatemala that plays an instrumental mixture of ambient black metal and funeral doom and this is a review of his self released 2015 ep "Orenyall". Ambient style keyboards start off the ep giving the music a very atmospheric feeling along with a variety of many different keys along with a tragic feeling and the songs at times also bring in elements of neo-classical and when drum beats are added onto the recoridng they also give the songs more of militant feeling. All of the songs on the recording avoid using any lyrics and vocals and when guitars are finally brought in the music they are only used in a slow fashion that also gives the music more of a funeral doom metal feeling which is also mixed in with a more depressive style of black metal and there is also a brief use of saxophones being utilized along with some of the tracks being very long and epic in length and when the music speeds up a small amount of blast beats are added onto the recording. 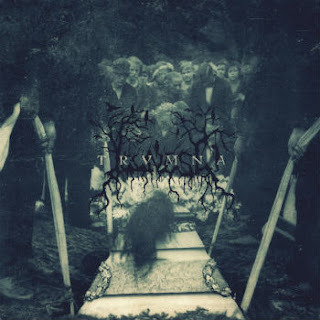 Funeral Art plays a musical style that takes an instrumental style of dark ambient and mixes it in with depressive black metal and funeral doom to create a sound of his own and the production also sounds very powerful for being a self released recording. In my opinion Funeral Art are a very great sounding instrumental mixture of ambient black metal and funeral doom and if you are a fan of those musical genres, you should check out this solo project. 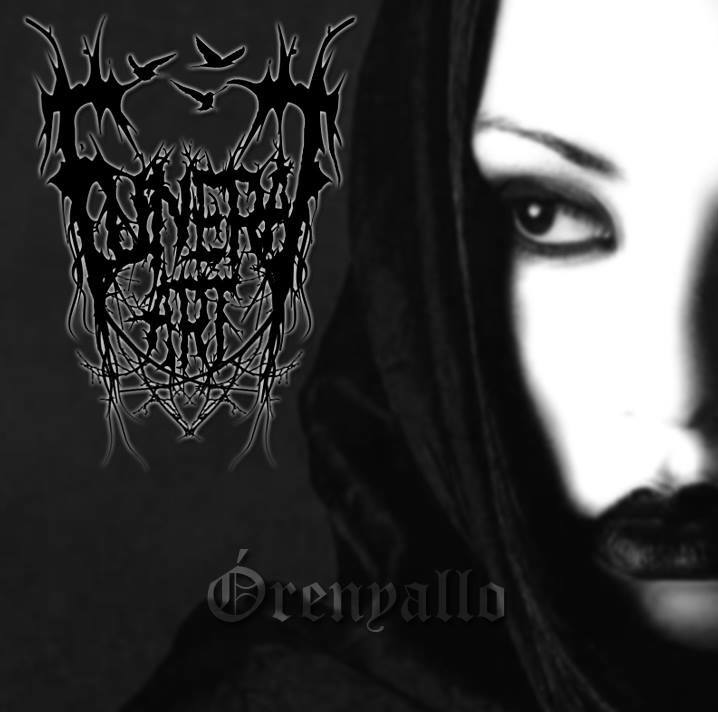 RECOMMENDED TRACKS INCLUDE "Orenyallo" and "Funeral Art". 8 out of 10. 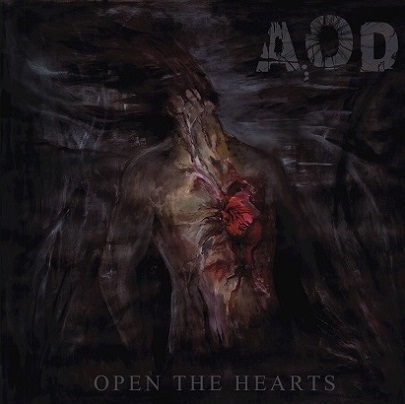 Architect Of Disease are a band from Poland that plays a very progressive and melodic form of black metal and this is a review of their 2013 album "Open The Hearts" which was released by The End Of Time Records. 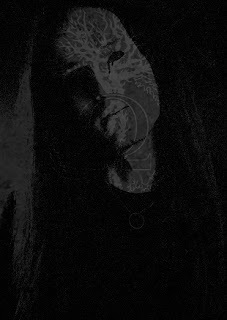 A very distorted, raw and melodic black metal sound starts off the album along with some grim vocals and all of the musical instruments have a very powerful sound to them and some of the riffs also bring in a touch of doom metal and the solos and leads that are utilized demonstrate a great amount of melody, talent and skill. 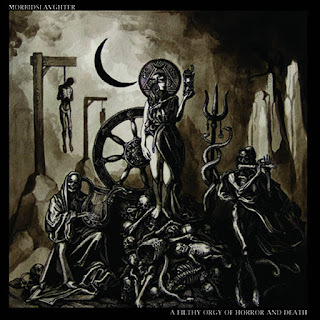 A couple of the tracks are long and epic in length and when the music speeds up the songs start bringing in more of a raw black metal style along with a decent amount of blast beats and the songs also bring in a great mixture of slow, mid paced and fast parts and some of the riffs also bring more of a progressive feeling to the recording while the songs are also in more of a modern black metal direction. Architect Of Disease plays a style of black metal that can be raw at times while also modern, melodic and progressive at the same time, the production sounds very powerful while the lyrics cover dark and philosophical themes. In my opinion Architect Of Disease are a very great sounding progressive black metal band and if you are a fan of t his musical genre, you should check out this album. 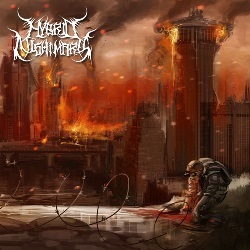 RECOMMENDED TRACKS INCLUDE "Leviathan Prayer" "Without Divine Intervention" and "Devour The Sun". 8 out of 10. Serpent Seed are a band from Poland that plays black metal with a touch of death metal and this is a review of their 2014 album "Debris Of Faith" which was released by The End Of Time Records. 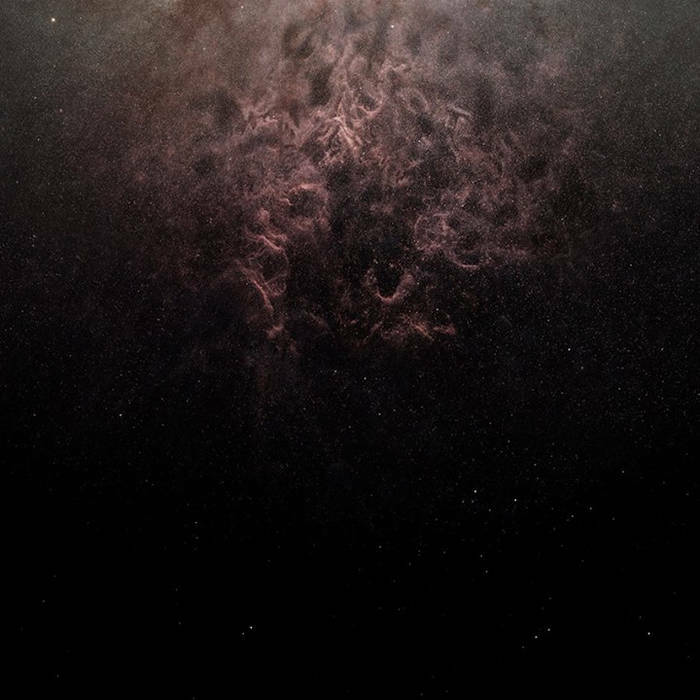 A very dark, heavy and melodic sound starts off the album and all of the musical instruments have a very powerful sound to them and after awhile vocals that are in between death and black metal are added into the music along with a few high pitched screams being used at times and when the music speeds up a great amount of blast beats are used. When solos and leads are utilized they are in a very dark and melodic musical direction and the songs also bring in a great mixture of slow, mid paced and fast parts and the music also brings in more of an early to mid 2000's style of black metal at times and some of the riffs also bring in elements of thrash and some of the fast riffs also bring in more of a raw style of black metal while some of the heavier riffs bring in death metal influences and one track also brings in a brief use of spoken word parts. Serpent Seed plays a style of black metal that is very dark and heavy and also mixes in elements of death metal to make their music stand out a bit more, the production sounds very professional while the lyrics cover dark, occult and blasphemous themes. 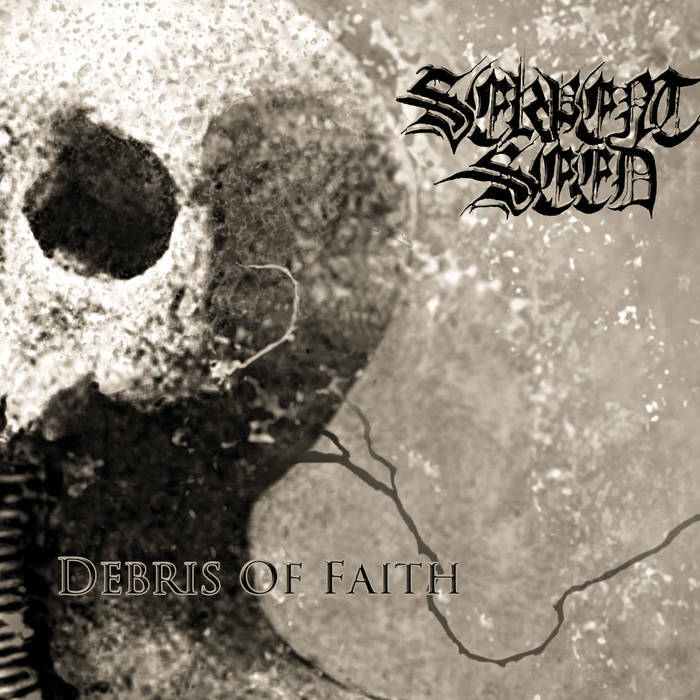 In my opinion Serpent Seed are a very great sounding mixture of black and death metal and if you are a fan of those musical genres, you should check out this band. RECOMMENDED TRACKS INCLUDE "Demon's Blade" "I Spit On Your Cross" and "Unholy Trinity". 8 out of 10. Illness are an international band that has been featured before in this zine with members from both Poland and Norway that play a schizophrenic form of black metal and this is a review of their 2015 ep "Trvmma" which was released as a joint effort by both Black Plague Records and Metallic Media. A Chopin classical piece starts off the ep and after the intro militant drum beats, melodic guitar leads and a heavier sound are added onto the recording and you can also hear the sounds of human torture in the background which also leads to more of a raw, fast and aggressive black metal direction that also uses grim screams and programmed drum beats. Drum beats on the recording gives the musi9c more of an industrial feeling while the guitar riffing brings in an old school Norwegian style black metal style but done with a touch of the Polish style and the songs also bring in a small use of spoken word samples along with some of the riffing utilizing a great amount of melody and they also bring in a cover of Mysticum's "The Kingdom Come" before closing the ep with 2 original tracks which also bring in a small amount of atmospheric synths which also bring in more classical music elements. 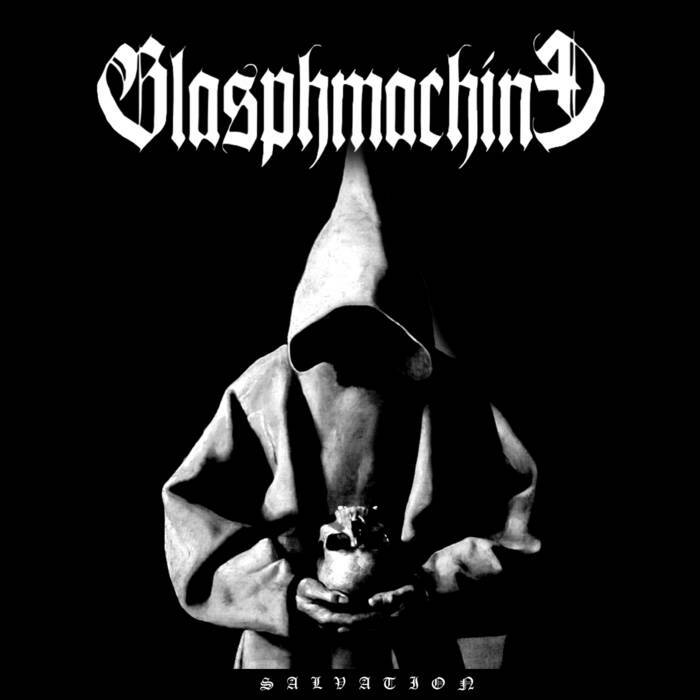 Illness plays a style of black metal on this recording that can be very heavy and raw at times while also adding in atmospheric, industrial and classical music elements to create a very original sounding recording, the production sounds very dark and raw while the lyrics are written in Polish and cover paranoia, illness. darkness and misanthropy themes. In my opinion this is another great sounding recording from Illness and if you are a fan of black metal that goes for a schizophrenic style, you should check out this ep. RECOMMENDED TRACKS INCLUDE "Trumma" and "Cranium". 8 out of 10. Cepheide are a band from France that has been featured before in this zine and plays an atmospheric form of black metal and this is a review of their self released 2015 ep "Respire". 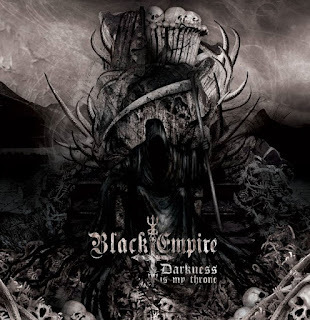 A very dark and melodic guitar lead starts off the ep along with some atmospheric elements and after a couple of minutes drums are added into the music which also leads up to more of a fast and raw black metal style that uses a great amount of blast beats and depressive screams and both of the tracks are very long and epic in length. Throughout the recording you can hear a great mixture of slow, mid paced and fast parts and the band also brings in elements of cascadian and post black metal and there are also some guitar riffs that bring in a small amount of melody along with a brief use of clean playing and when synths are utilized they enhance the atmospheric elements that are present on the recording and the last track starts out in an ambient direction before making a return back to more of a raw and atmospheric style of black metal. Cepheide continue the modern style of atmospheric black metal that they had establish on the previous recording and create 2 very diverse and epic tracks that combine atmospheric, post and cascadian black metal together while another song goes for an ambient style of the genre, the production sounds very dark and heavy while the lyrics are written in French and cover dark themes. In my opinion this is another great sounding recording from Cepheide and if you are a fan of atmospheric black metal, you should check out the ep. RECOMMENDED TRACK "I Le Souffle Brulant de I'llmmacule". 8 out of 10. Vindkast is a project that has existed in various forms for some time now, from studio project to full band and vice versa. However, until roughly two years ago, the circumstances for recording and releasing an album have somehow never been right. 2.In May you had released an album, how would you describe the musical sound that is presented on the recording? The music on Archaic Collapse could be described as black metal with a strong hint to ambient and drone music. Atmosphere played a key role in the songwriting as well as creating a coherent soundscape that would run throughout the whole album. The lyrical concept of the album is layered, however there are common metaphors and themes on every level of interpretation such as the process of overcoming, death and rebirth, the primal myth. These concepts can be interpreted on personal and spiritual levels. They can also simply be seen as observations of the coherencies in this world and the consequences that one could draw from them. 4.What is the meaning and inspiration behind the name 'Vindkast'? Vindkast means gust of wind in Norwegian and was chosen to reflect the sense that the music should evoke in the listener before any of the lyrical concepts of the album were developed. So there is no significant relation between the lyrics and the name. However, I find the name still to be very fitting to the sound and mood of the music. For now, Vindkast remains a studio project, but arrangements have already been made for it to transform into a band and to perform live sooner or later. Time will tell. 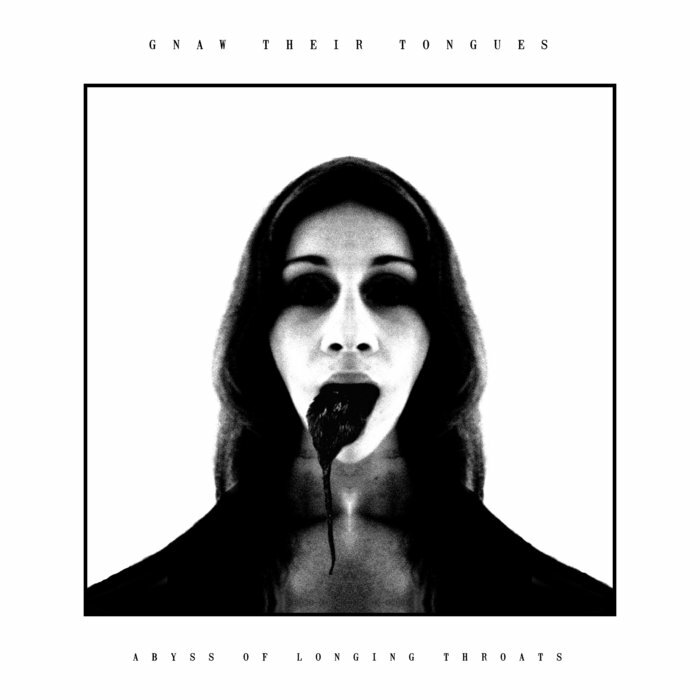 The album will be released by the German label Urtod Void on tape later this year. Also, a self-released CD version is currently in production and will be available directly from the band sometime soon. 7.On a worldwide level how has the feedback been to your music by fans of ambient and atmospheric black metal? The feedback to the album has been great so far, a lot of people seem to enjoy the atmosphere of the album and cherish the work that has been put into it. Sure, the following of Vindkast is comparatively small, but you can't blame people when there is so much quality music out there. 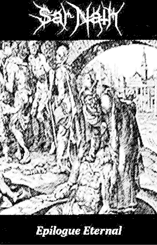 I am working on new released with both my apocaplyptic folk band Death Of Abel as well as my industrial noise project Blood Vault, one of them likely to be released later this year. Besides that, there are a couple of other things I am working on with different people at the moment, some of which will be unveiled fairly soon. There will definitely be a shift in the sound of Vindkast from ambient to a more full-on black metal vibe. The writing process for a new EP has almost been completed, and it already shows a lot of tendencies towards relentless blasts and beastly cold riffing. To name all the bands and artists that have had an influence on the music of Vindkast would probably take up a page or two, but bands such as Paysage D'hiver, Ulver, Krallice, Furia, Altar Of Plagues and Wolves In The Throne Room have, among others, definitely played a significant role in the development of this project. Currently I am listening to the debut albums of Wiegedood, Kjeld and Nahtrunar a lot. As far as I'm concerned, all three are probably among the best black metal releases of the past couple of years, but then again, one easily loses track of all the good releases out there. Nonetheless, highly recommended on my part! Besides the occasional hike, I am interested a lot in films, literature and politics. However, most of my thoughts do revolve around music or end up in it. Thank you a lot for you interest, time and patience! And to anyone who enjoys the music of Vindkast, feel free to share if you think it is worth it!